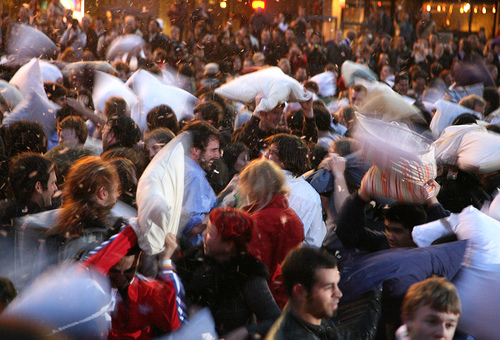 As a throwback to the days when life was easy, Banditos Misteriosos, ("an organization composed of artists, musicians, improvers and just-plain-everyday-people-ready-for-fun," according to its website), is sponsoring a citywide pillow fight Saturday on the Boston Common at 1 p.m.
2. Only hit those who are holding pillows. 3. Arrive early and remain inconspicuous until 1 p.m., then rush in. 4. Spread the word and bring your friends, kids, etc. All pillow-fighters are asked to meet at the Cathedral Church of St. Paul Episcopal, 138 Tremont St.
And Bandito's best tip? Costumes are encouraged. About Go To It Hot events around the Hub. Katie Johnston Chase likes dive bars, old country music, and pop art that has something to say. Meredith Goldstein is keen on DJs who spin pop music and restaurants that serve real food after 11 p.m.
Emily Sweeney is a lifelong Bostonian who goes out all over, from Irish pubs in Southie to the roller rink in Dorchester. Jeff Miranda has never heard a '90s alternative-rock jam that's not already a mainstay on his iPod. Joan Charlotte Matelli digs movie singalongs, well-made cocktails, and alt-country rockers. Courtney Hollands is a shopaholic and a music junkie with a penchant for tapas, chai, and Hall & Oates dance parties.